With the end of the year drawing near I figured it was about time I’d finish this skirt that I almost completed in January already. I know I’m not the only who prefers to sewing garments in fancy prints while neglecting basics in solid colours. 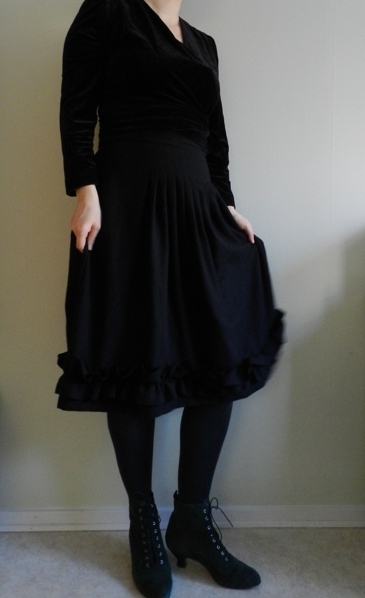 However, as I tend to have trouble finding affordable black skirts that go with everything but that aren’t too boring or made out of flimsy synthetic materials, I decided to make one myself. Burdastyle 08/2009 #107. Trench Style skirt. 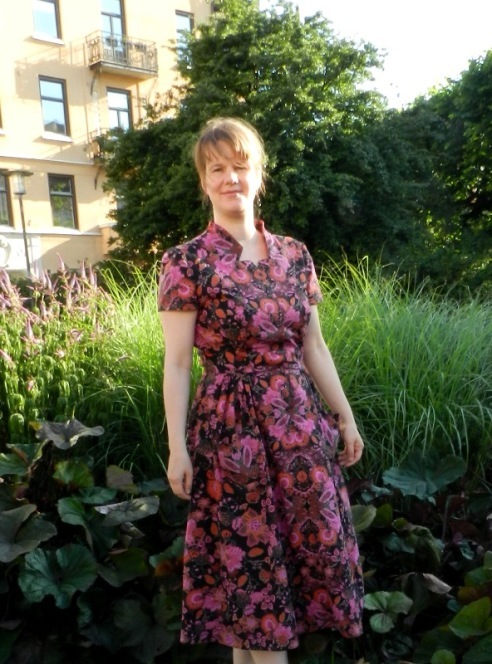 The pattern I chose is #107 from Burdastyle magazine 08/2009, an issue from which I hope to sew more in the future. It is a classic A-line skirt with two pleats in the front and the back. 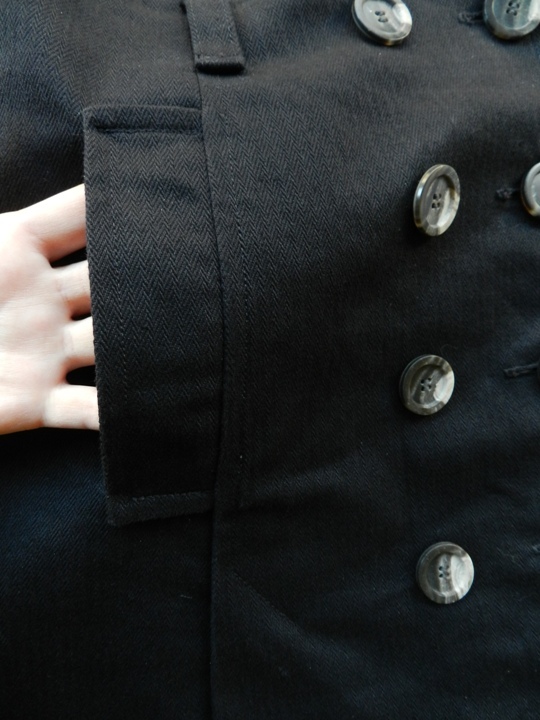 As the name of the pattern indicates, the skirt has several trench coat-like features, such as welt pockets, belt loops and a “double-breasted” closure, all accentuated by topstitching. Due to the many steps involved in its construction it is not the fastest skirt to sew up but well worth the effort, I think. Today the sun showed herself for the first time in many days, so it was at last light enough to take some pictures. Unfortunately, I did not see the huge crease on the front of the skirt in time. Well, it was this or no pictures at all. Burdastyle’s instructions were vague as usual. I used them mostly to determine in what order to assemble the parts. Overall, the construction was straightforward with the exception of the inner pockets. For some reason, they seemed to collide with the corners of the pleats. Perhaps I should just have trimmed the seam allowances a bit more to create space. Anyway, while it does not look that clean on the inside, I am quite pleased with how the welt pockets turned out on the outside. The black canvas-like fabric with a herringbone structure was another thrift store find that had been in my stash for years. It is easy to iron, also at high temperatures, so I suspect that it mostly consists of cotton, possibly with something else blended in. 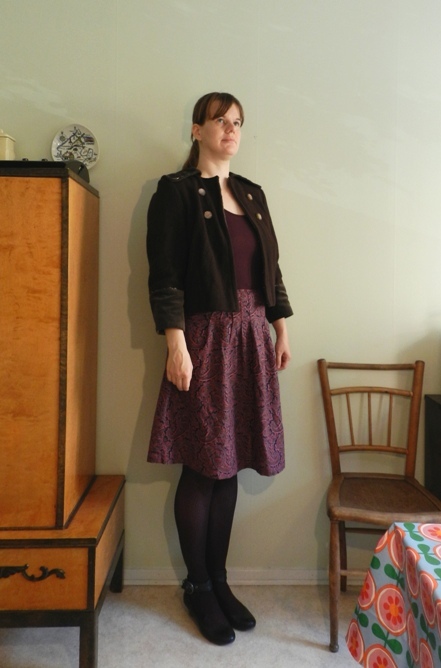 It is a bit heavier and stiffer than the fabrics recommended for this skirt, but it does make it more suitable for the winter months, which is when I most often wear black skirts. The stiffness makes the skirt stand away from the body, but I quite like it like that. The back also has two pleats. Initially, I planned on using black plastic buttons that emulate leather buttons. I really liked how they gave the skirt a slick retro look. 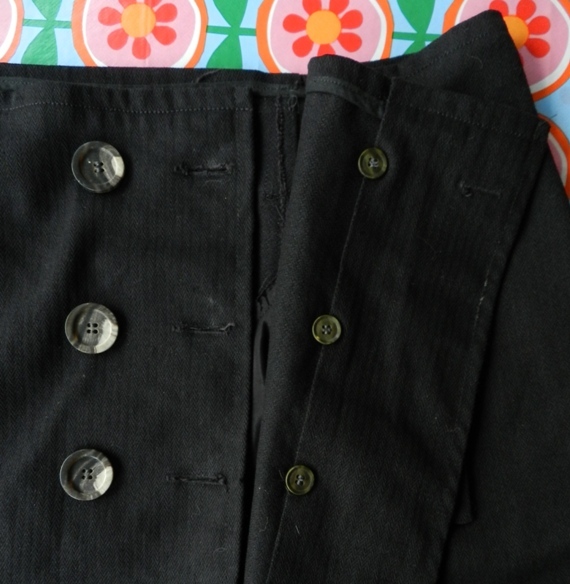 As I picked up a whole bag of these buttons at the charity shop for 10 sek, I figured I might as well add an extra row of buttons to keep the skirt closed when cycling. Unfortunately, once I had sewn on all buttons and tried on the skirt, two buttons spontaneously broke off. To the left: the black buttons that did not function well. If this was CSI instead of a blog, one would be able to blow up the reflection in the buttons to prove that my neighbours were home watching television at the time the picture was taken. I am still not exactly sure what caused the breakage. 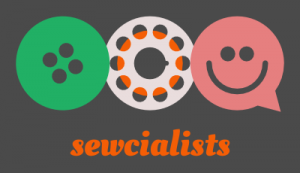 Perhaps some of the buttons were faulty to begin with, but it may also have been the combination of heavy, stiff fabric and relatively light-weight buttons that were sewn on too tight. Whatever the reason, I decided the safest solution was to replace all buttons with a more sturdy kind. This was easier said than done, especially because I refuse to buy expensive new buttons when the world is full of old unused buttons. 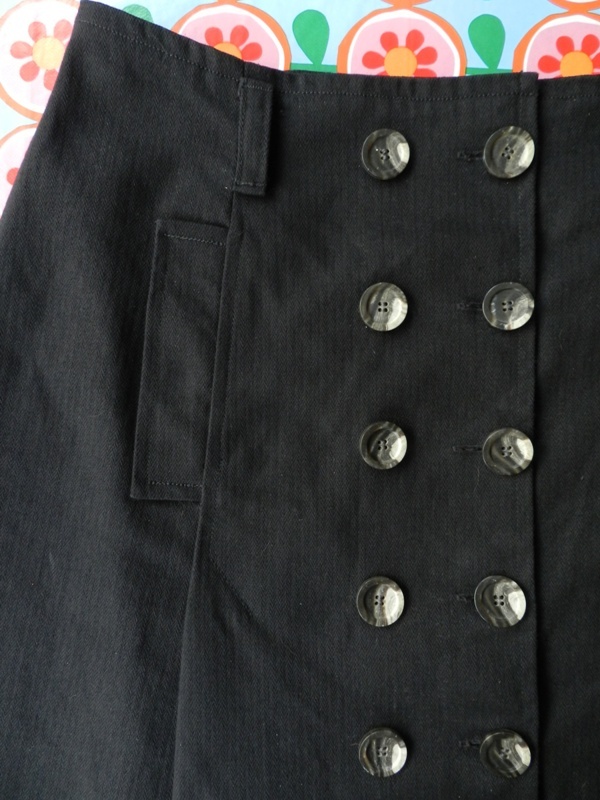 By the time I found the horn buttons, which fit better with the style of the skirt anyway, spring had arrived and other projects caught my attention. 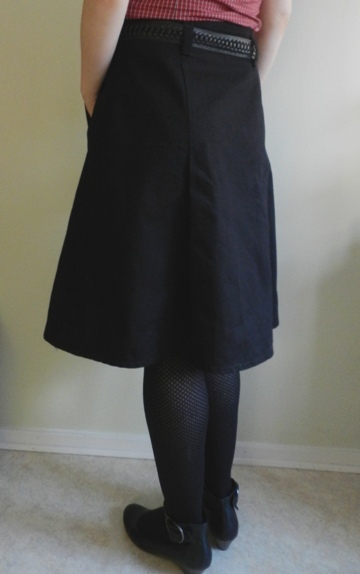 I may have placed the buttonholes too far to the right, not realizing that the buttons would not stay in the center of the buttonhole when wearing the skirt. Besides adding an extra row of buttons, I made some other small changes. In order to reduce bulk and because I figured that my fabric was stiff enough to hold up by itself, I simple bound the raw top edge of the skirt with bias tape and then folded it over instead of using facings. I placed the buttons closer together than the pattern indicates, partly because I was afraid the skirt would be too tight on me otherwise and partly because I wanted to make sure they were also attached to the front facings. According to the pattern, the buttons are fastened to a single layer of fabric, which does not seem very durable. 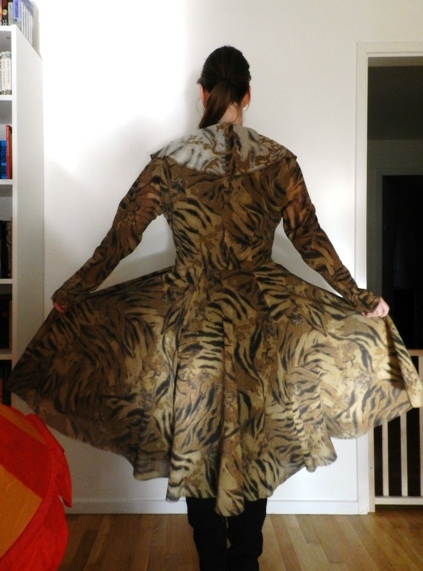 Showing the narrow front facing and the bias-bound waist. I didn’t bother making the belt as I have several black leather belts that I could pair with the skirt. For a while I considered leaving of the belt loops as well, because I don’t usually wear beltet skirts with a shirt tucked in. I’m quite happy I changed my mind about that, though, and think it feels more comfortable than expected. The skirt is also more high-waisted than what I’m used to and looking at the pictures I think I could perhaps even wear it a bit higher. Anyway, I expect to be getting a lot of wear out of this skirt and I am looking forward to creating different outfits with it! 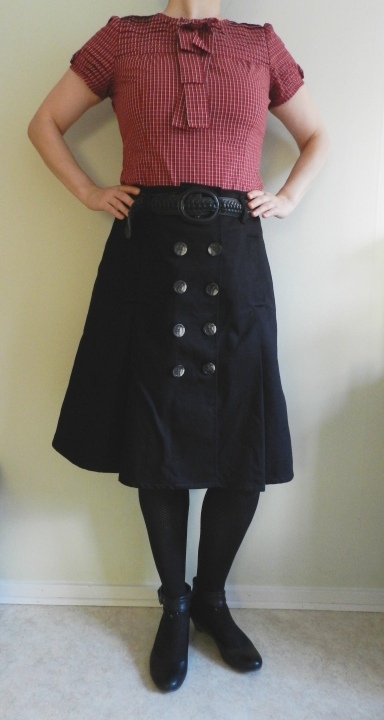 I just sewed the buttons on this very skirt today! I agree with your reasons for liking the skirt. It’s not a quick sew, but definitely worth the effort. Your skirt is great! Thank you! I tried linking to the Burdastyle website, but the pattern doesn’t seem to be available online, which is a pity, as it’s quite special. In my experience, this kind of flared skirt is not too difficult to fit and it’s probably even easier with this pattern because of the button closure. The blouse is by Warehouse and a couple of years old by now (got it second hand). 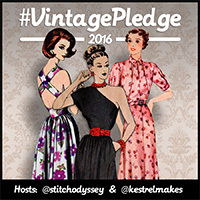 It has really cool pleated sleeves that I would like to recreate some time. I love your skirt. What fabulous features, not boring at all and much better than RTW. Thank you! I’m still very happy with my skirt and wear it regularly. Definitely worth the effort.